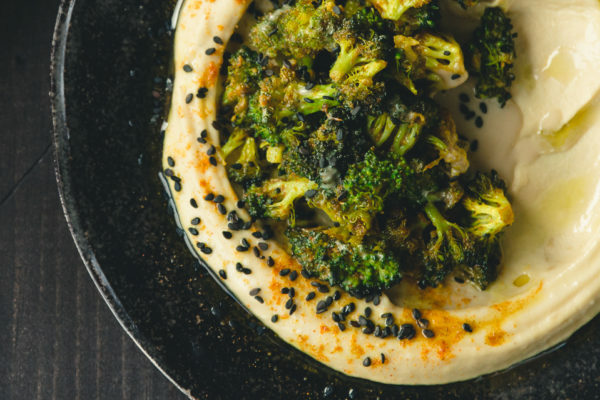 I’m not sure if I should apologize for putting tahini in everything or not. It just comes so naturally to me since it’s a flavor I grew up loving with everything from schnitzel to ice cream. It was my peanut butter growing up. I love hearing my daughter ask for it now. “Tahina and beesous pease!” Translation: “I would really enjoy some tahini and sprinkles with my yogurt, please and thank you mother.” It’s delicious and nutty and full of the best kind of fat and nutrients. So should I apologize? Probably not. 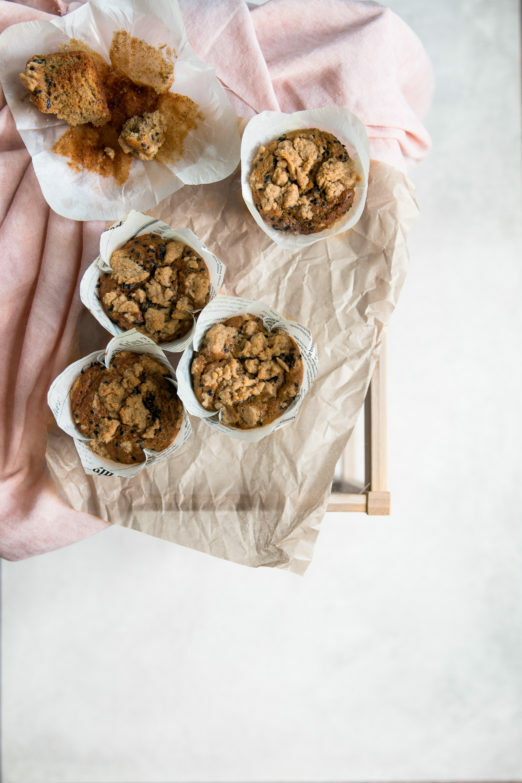 I’m getting some great feedback from everyone making my Tahini Blondies, Brown Butter Tahini Rye Cookie Cups, Tahini Mousse Pie, Tahini Chocolate Chip Cookies, and Banana Tahini Cake. This makes me soooooo happy. 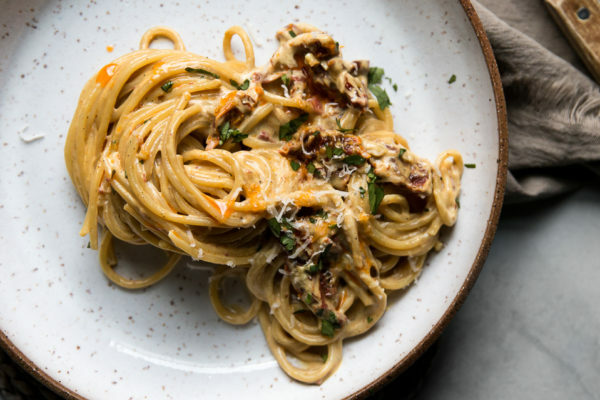 Sometimes when I write recipes, I feel like people just look at the photos, pin them and then forget them. But you guys have really been making them! 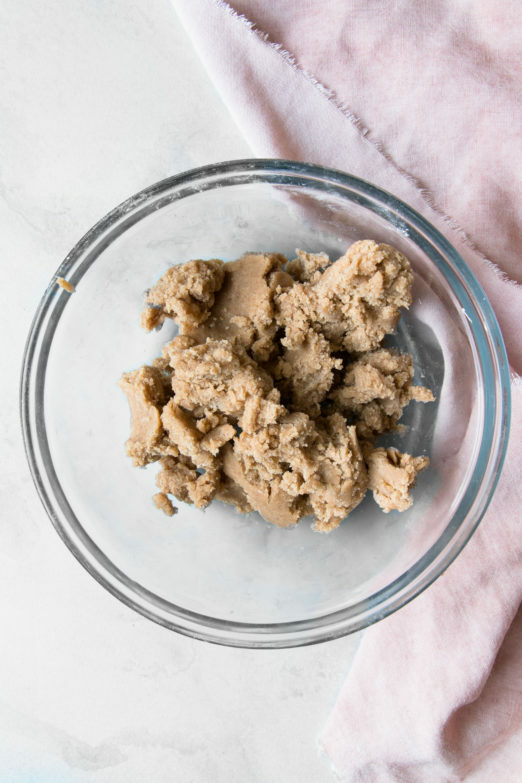 It’s encouraging and that is why I will not quit this tahini moment until someone tells me to… which will most likely be my waist… but then again that hasn’t stopped me yet. 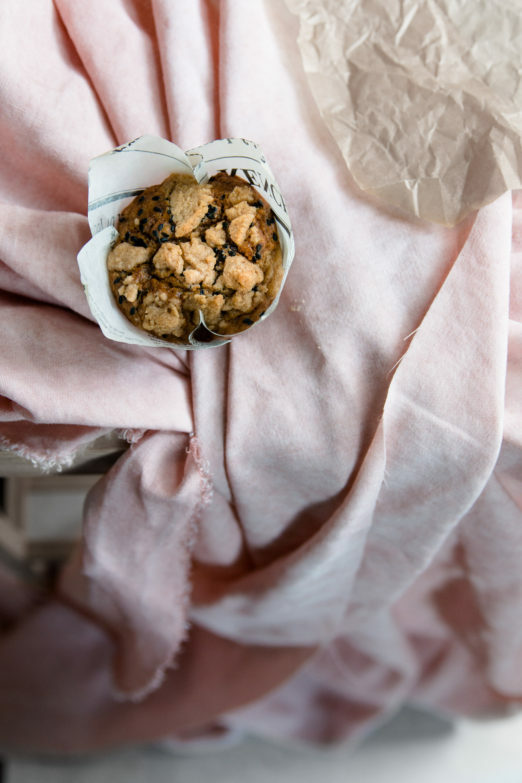 Living in New York City in my past life as a student at NYU, FIT, and then later as an assistant fashion designer, I grew accustomed to being able to grab a classic crumb topped coffee cake at every corner bodega. My weekly coffee cake habit broke as soon as I realized that it wasn’t as accessible in Toronto. I eventually forgot all about coffee cakes. Very sad. 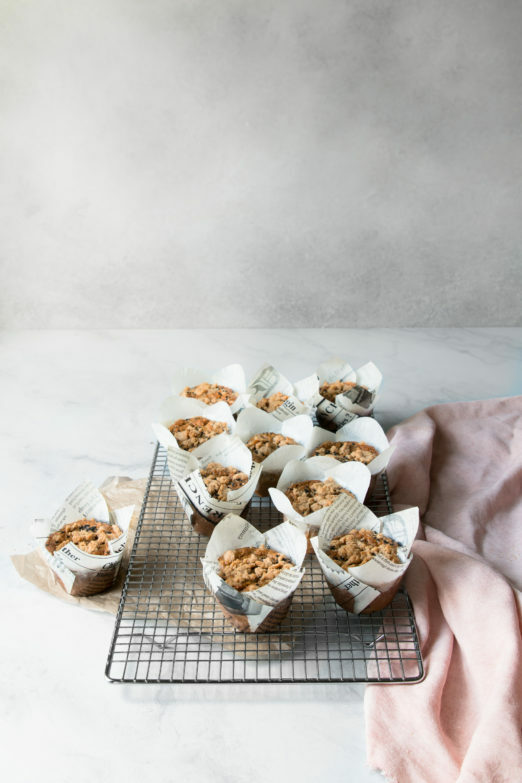 Until I had a co-working day with my friend Hollis, founder of Juniper & Salt , that the thought of chunky, cinnamon-y, streusel crumbs popped back into mind after years of lying dormant. These came to be thanks to my daughter, Zoe, who decided one day that she didn’t like bananas anymore. I was going through my first test of these muffins after having 4 bananas go way past their ideal eating ripeness. 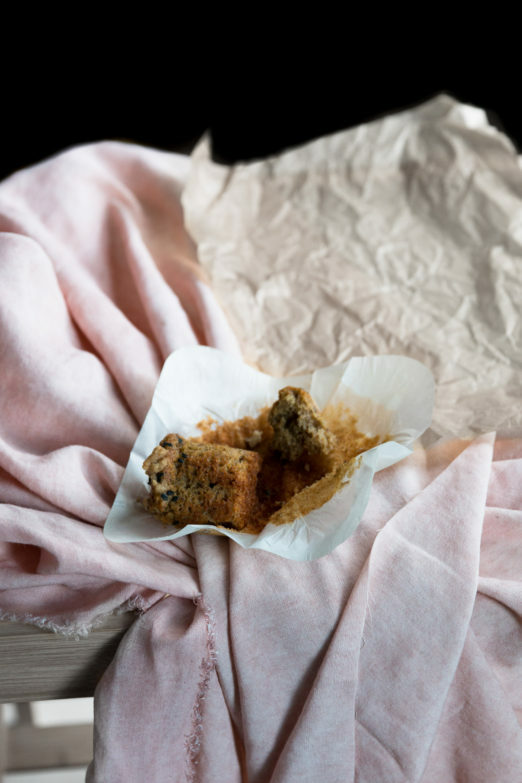 My initially thought was to make this recipe as a loaf but as a result of my impulsive purchase habits of these super cute newspaper looking parchment muffin cups, I knew they needed to be in muffin form. First of all, tahini and banana just go very well together; it’s like PB and banana. But when you add cinnamon to the nutty goodness of the tahini and the creaminess of banana, it really sings. 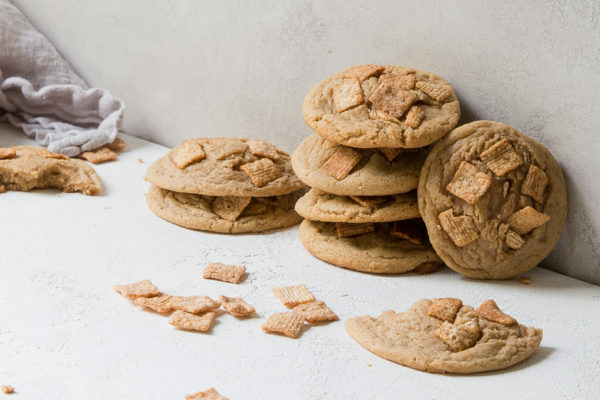 Not to mention that cinnamon is a classic streusel-crumb flavor. To make myself feel better about feeding these to Zoe, I tried to make them “healthier” by adding some ground flax and oats. Ha! These aren’t really healthy so don’t @ me please. 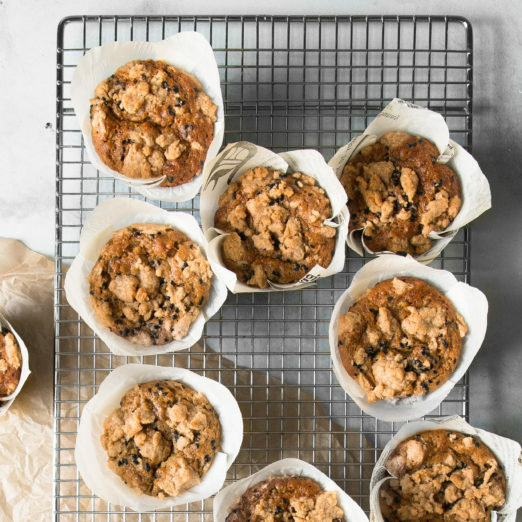 Soft, moist, crumbly, sweet, nutty, and a two-bowl mixing situation, these muffins are really freaking good. Bananas need to be SUPER ripe. A yellow banana with some brown spots aint goin’ to cut it. You need to let your bananas get to the point where they are mostly brown with a few yellow spots. I usually throw them in the freezer when they get to that point. This allows me to pull them out when I’m ready to use them for baking anything. Their sweetness really develops when they get that ripe. I use my handy immersion blender to get the bananas “mashed”. It blends them super fast and extra smooth. This way is recommended if you have one instead of using a fork or masher. I’m going to sound like a broken record here but please, please, please, get yourself a kitchen scale. I create all my recipes by weight and that is how they are intended to be made. I’ve written the conversions in the recipe too but they will not be as accurate. These are good for a few a few days if stored in an airtight container on the counter or in your fridge. The only thing that happens is that the crumb topping moistens and isn’t as crumbly. Still delicious though. 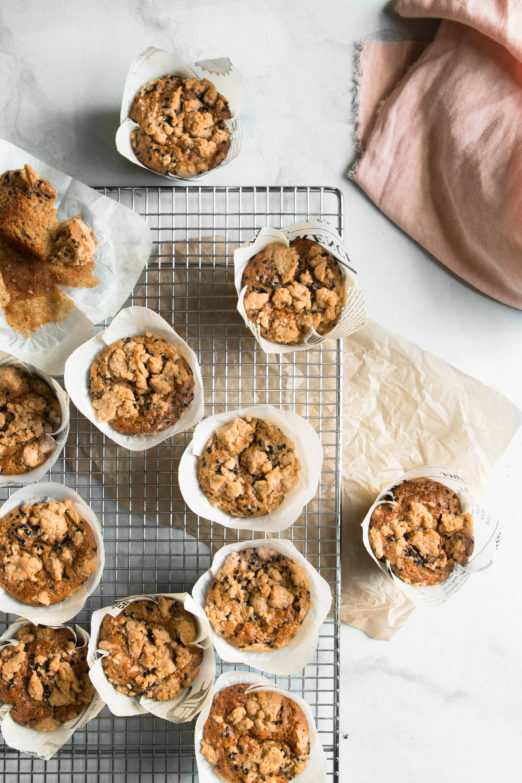 Pre-heat oven to 350˚ F and line a muffin tin with large muffin cups, preferably the big lotus parchment cups. 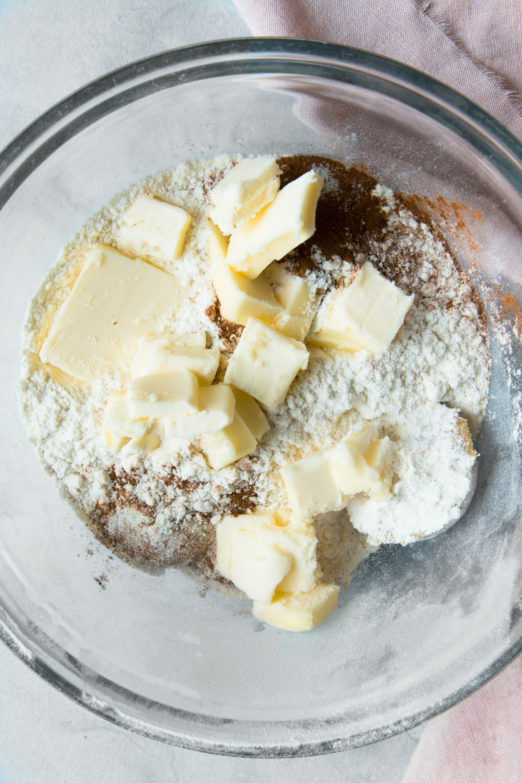 In a medium bowl, combine the streusel ingredients and using your fingertips, work the butter into the dry ingredients until a large, moist crumb forms. 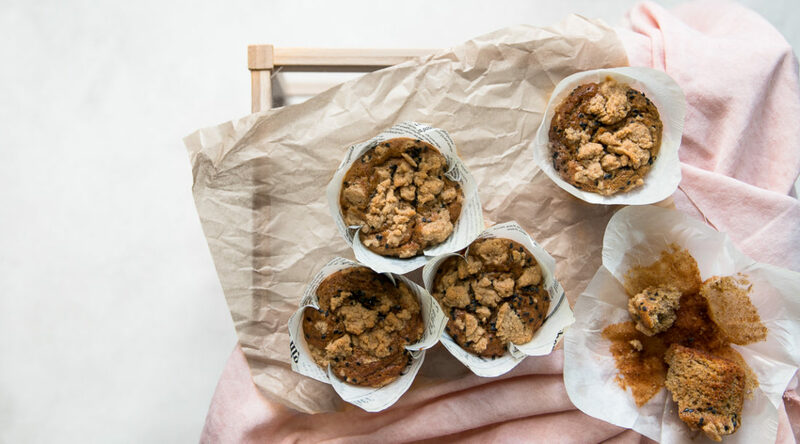 Set in the fridge until ready to crumble on muffins. In a separate large mixing bowl, whisk together all of the wet ingredients. 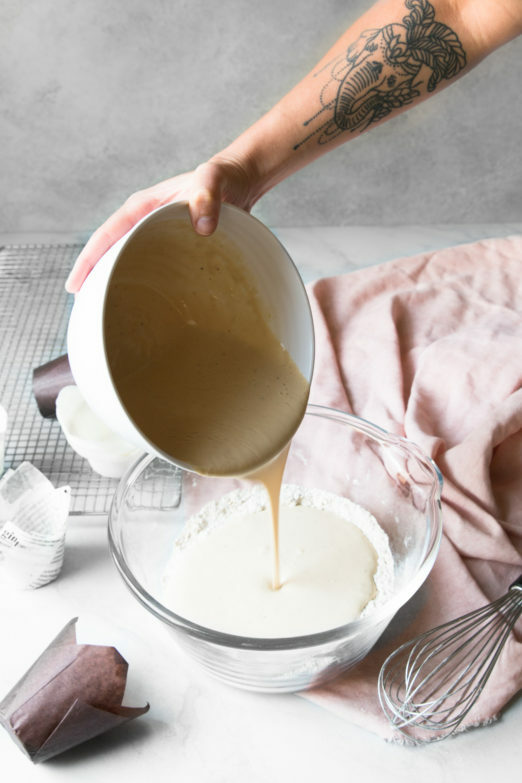 Pour the wet ingredients into the dry and whisk until just combined, taking care not to over-mix. 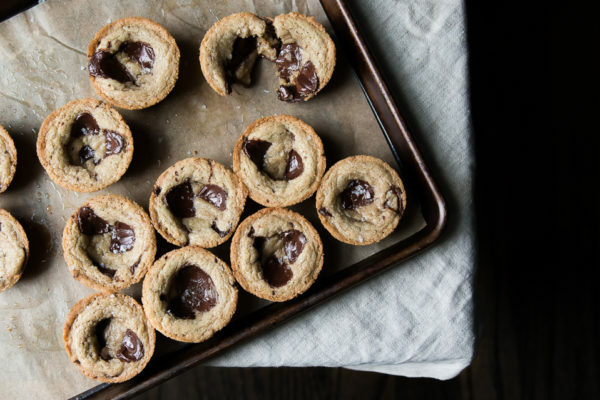 OPTIONAL: toss any add-ins like nuts or chocolate chips in a bit of flour then mix them into the muffin batter. This will prevent them from sinking to the bottom. 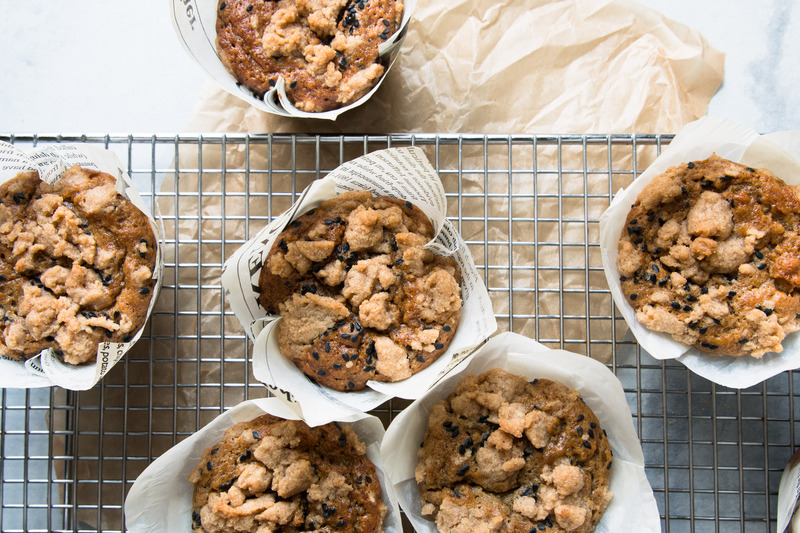 Divide batter evenly among muffin cups and sprinkle the tops with lots of black sesame seeds. 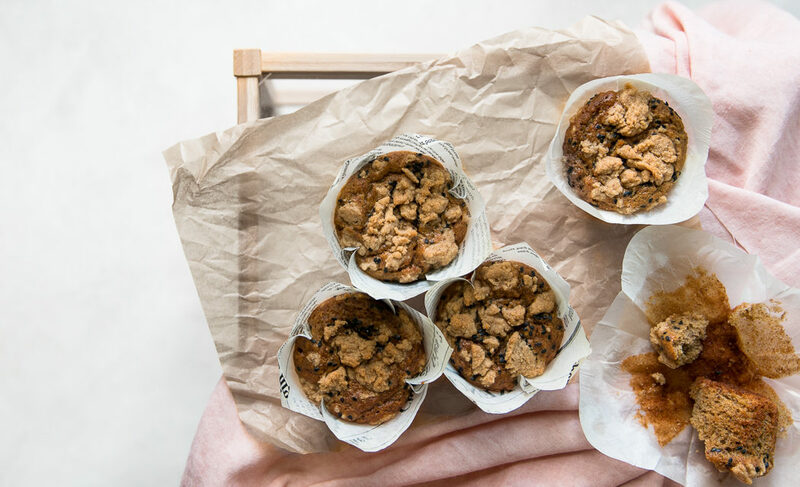 Crumble the chilled streusel topping on to each muffin leaving some big chunks and some smaller ones. Bake for 30-35 minutes or until a tester inserted into the center of the muffin comes out clean. Transfer the pan to a wire rack and allow them to cool. After about 3 minutes, turn them out onto the rack and let them cool completely.